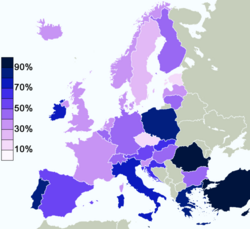 Shown here is the percentage in each country which responded that "they believe there is a god". Theism is the religious metaphysical philosophy that asserts God exists and that He created and sustains the cosmos. Classical theism supports a creator God that not only exists but is omniscient, omnipresent, exists necessarily, is nonphysical, eternal and essentially good. The Cambridge Companion to Atheism puts the philosophical position of theism as, "belief in a personal God who takes an active interest in the world and who has given special revelation to humans." The most competitive alternative philosophy within the modern intellectual climate is metaphysical naturalism. An entrenched philosophy of science acting without the existence of God and the soul, preceding with the assumption of strict materialism. Charles Taliaferro, a prominent philosopher of religion defines theism against the backdrop of Richard Dawkins criticisms. Dawkins and critics in general tend to think that if theism is true, proof of the existence of God should be found everywhere and in everything. Theism does not concern scientific specifics like mathematical formulas, quantities and intricacies of physics or DNA methylation within a unit of biological variation inheritance called epigenetics for example. Theism may support events within creation like spiritual and religious experience by human persons, but on the other hand, the millions of cells that make up that person would not be used by theistic philosophers. Rather theism philosophically expounds by inference that a transcendent mind of God is metaphysically necessary in order to maintain the cosmos as a whole. The scientific method, not in opposition but in a supplemental role within theistic natural theology, becomes a vehicle for scientific knowledge, which is then used by constructing logical arguments like the cosmological argument around current leading scientific theories like the big bang theory. Through this interplay of science and philosophy within the position of theism, there is a relationship of the metaphysical down to the local of physics and natural mechanisms of creation. Theism can be divided into at least three major sects: monotheism, which holds that there is one God, polytheism is the belief in many gods, and the pantheists who view god and nature as part of the same spiritual plane and inseparable. Some Deists believe that there was a god at the beginning of the universe, but either that god has ceased to exist (see Second Coming for an example of this applied to Christianity), or has ceased to interact with the material world. Prophets/Messengers provide authority to believers who regard the prophet/messenger as having either spectacular personal insight, or direct personal communication with the divine. 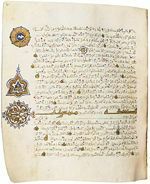 Examples include Jesus, Buddha, Moses, Ayya Vaikundar, Bahá'u'lláh, and Muhammad. Polytheistic religions such as Greco-Roman religion and certain aspects of Mormonism assert that there are many gods. Theistic realism is a philosophy based on the idea that God is real, acts in the universe, and is knowable through the senses and reason. As such, theistic realism stands as a middle ground between philosophical naturalism and fideism. While philosophical naturalism holds that the universe is self-explanatory, theistic realism holds that the universe can only be comprehensively explained with reference to God. While fideism holds that reason and evidence cannot lead to God, theistic realism holds that the design and works of God are manifestly evident in nature, particularly Creation, so that evidence and reason lead inevitably to belief in God. Metaphysical naturalism or ontological naturalism is a worldview in which reality is composed of nothing but natural things, forces, and causes. All concepts related to consciousness or to the mind refer to entities which are reducible to the same such natural things, forces and causes. Within naturalism's metaphysics there is no objective existence of any supernatural being, force or cause, such as are described in various religions and mythological accounts. All supernatural things are ultimately explainable purely in terms of natural things. Metaphysical naturalism is a monistic and not a dualistic view of reality. The explicit and sole focus on the natural world has driven modern science into accepting naturalism as the predominant philosophy of science. Many Christian philosophers like Alivn Plantinga and William Lane Craig have deemed naturalism as maintaining a stronger stance than atheism. According to Plantinga naturalism not only presupposes the non-existence of God but extends over all areas of life answering a range of deep existential questions like how life should be viewed, what the world is fundamentally made of and what the purpose of humanity actually is. From this metaphysical position philosophers have charged naturalism as being a worldview and thus granting the cognitive functions of a religion missing support for only the outward actions of worship and/or ritual. God’s Numbers The latest Newsweek poll shows that 91 percent of American adults surveyed believe in God. Newsweek, April 9 2007. This page was last modified on 13 November 2018, at 16:15.